Truth is, it is complicated, with all sorts of things going on. Enzymes are going to work, starches are turned into simpler sugars, but the hot water is also destroying the enzymes. This is a rabbit hole from which you may never emerge.1 But if you just want to bake a tasty rye, let’s get going. 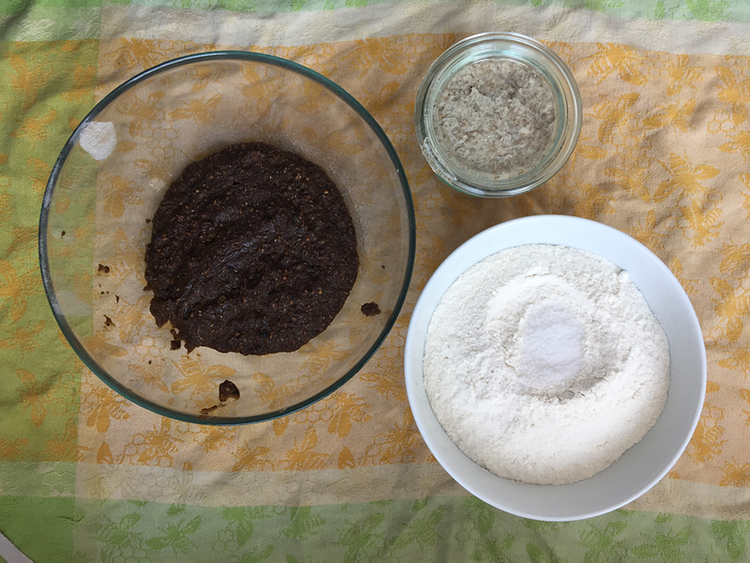 The day before baking, use half the rye flour to build your starter. I use about 10 gm of either of my two starters. Mix well with 75 gm rye flour and 75 gm water. Set aside for 8-12 hours. I love the way rye gives starters a kick and results in a light, spongy leaven. Bring the coffee (any kind, really, not too strong) to the boil with the crushed pepper corns and whichever seeds you have chosen. Remove the saucepan from the heat and add the remaining 75 gm of rye flour, stirring all the while with a whisk. Scrape the scalded rye out into a bowl and set aside to cool to near room temperature; anywhere below about 25-30 °C. Add the rye leaven, the white flour and the salt and mix. You might think it is never going to come together, but it will. 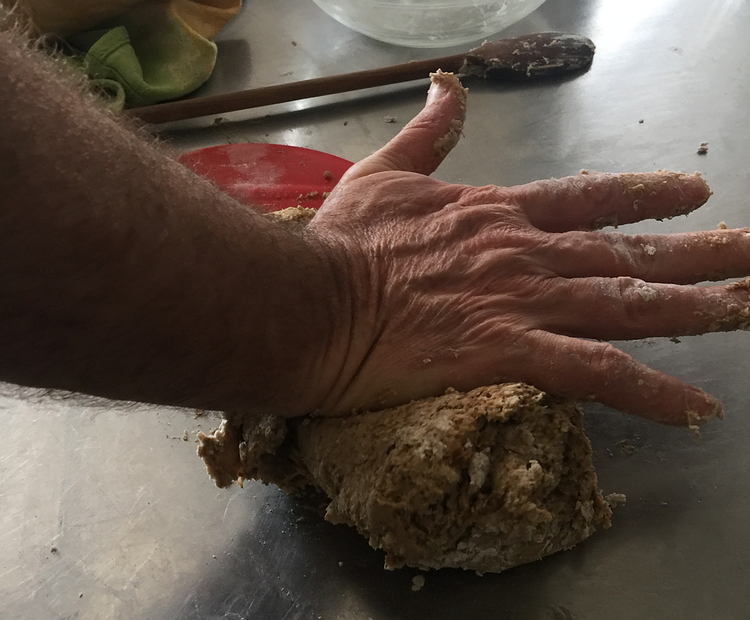 At some point, I tip it all onto the counter and mash it with the heel of my palm, scraping up the drier bits and tipping them into the centre of the dough. Eventually you will have a smooth, slightly sticky ball of dough. Put it into a clean bowl, cover, and set aside for 10 minutes. Lightly oil the counter top; just a dribble spread around with the palm of your hand. Tip the dough from the bowl onto the counter and give twenty quick kneads. Push, turn, fold. Gather the dough up into a ball and place it back in the bowl, covered. Repeat the quick knead twice after 10 minute intervals. You’ll be pleasantly surprised how smooth and unsticky the dough becomes in a remarkably short period. After the third quick knead, leave in the bowl, covered, for about 60-90 minutes for the final phase of the bulk fermentation. Tip the dough out of the bowl and shape. I did this on the lightly oiled counter, by first patting the dough out into a rough rectangle and then rolling it up tight, as originally advised by Dan Lepard. The problem with this is that the loaf unrolled as it rose, a purely cosmetic fault but one that is easily avoided by using an alternative shaping method. In any event, you want a nice, tight loaf. Put that on a piece of baking parchment and allow to rise, covered, for about 60-90 minutes. Possibly because of the sugars released by scalding the rye flour, this bread ferments much more quickly than an ordinary sourdough. 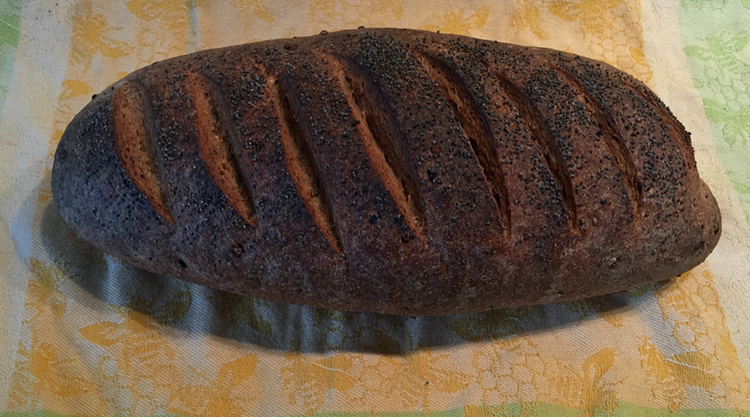 When the loaf is ready, score with crosswise slashes and coat with eggwash and poppy seeds if you like. Bake at 230 °C for about 40 minutes, with steam for the first 20 minutes. Allow to cool thoroughly before slicing. Black pepper rye is brilliant with peanut butter and just about anything else savoury rather than sweet.